or conditions and to expect the most favorable outcome. 2. the belief that good ultimately predominates over evil in the world. 3. the belief that goodness pervades reality. 4. the doctrine that the existing world is the best ofall possible worlds. II. Peace, Not the Time for Peace In Jeremiah. and optimism and false prophets. stretch out my hand upon the inhabitants of the land, saith the LORD. covetousness; and from the prophet even unto the priest every one dealeth falsely. peace; when there is no peace. time that I visit them they shall be cast down, saith the LORD. inhabitants of the land...” (6:12) Three reasons are listed. 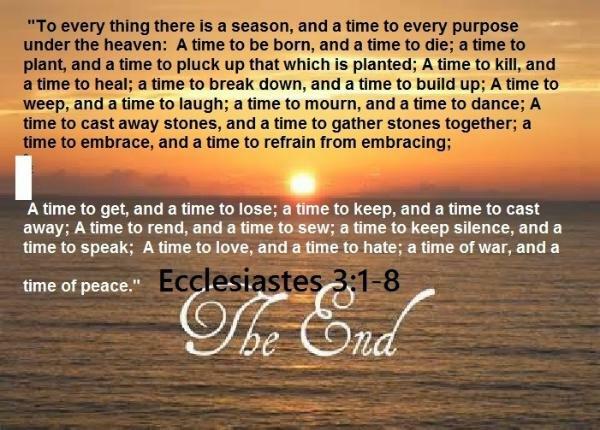 Peace when it is a time and circumstance under God when THERE IS NO PEACE! messages for the immediate future. mention of peace in Jeremiah. saying, Ye shall have peace; whereas the sword reacheth unto the soul. a good message at the right time, but not now! 3. Jeremiah 8:15 must be understood in the context of the Jeremiah 8 chapter. Jeremiah and how it is abused in messages today, from the religious and secular world. popular are, the two Js, _Joel and Jimmy. 4. Peace in peaceable of 9:8. More like civility and kindness. 5. Land of peace in 12:5. 6. No flesh have peace in 12:12. 7. What the prophets were saying about peace in 14:13.
neither shall ye have famine; but I will give you assured peace in this place. today, more the social prophets of the future. Revelation as the specifics of the guaranteed destruction is spelled out item by item. the subject continues as such only as a attack by God on the prophets. because of the words of his holiness. places ofthe wilderness are dried up, and their course is evil, and their force is not right. profane; yea, in my house have I found their wickedness, saith the LORD. profaneness gone forth into all the land. For who hath stood in the counsel of the LORD, and hath perceived and heard his word? marked his word, and heard it? grievously upon the head of the wicked. thoughts of his heart: in the latter days ye shall consider it perfectly. have turned them from their evil way, and from the evil of their doings. Am I a God at hand, saith the LORD, and not a God afar off? and earth? saith the LORD. neighbour, as their fathers have forgotten my name for Baal. word faithfully. What is the chaff to the wheat? saith the LORD. therefore they shall not profit this people at all, saith the LORD. will even punish that man and his house. answered? and, What hath the LORD spoken? for ye have perverted the words of the living God, of the LORD of hosts our God. Thus saith the LORD of hosts; Ye shall certainly drink. of the earth, saith the LORD of hosts. whirlwind shall be raised up from the coasts of the earth. be dung upon the ground. all the people that were in the Temple. countries, and against great kingdoms, of war, and of evil, and of pestilence. shall the prophet be known, that the LORD hath truly sent him. 12. Jeremiah (29:7) talking to those in captivity to seek the peace of the city that they are in. pray unto the LORD for it: for in the peace thereof shall ye have peace. perform my good word toward you, in causing you to return to this place. to give you an expected end. you again into the place whence I caused you to be carried away captive. 14. Jeremiah 30:5 about the latter days of the last days. abundance of peace and truth. 16. Jer 34:5 King Zedekiah will die in peace. pronounced the word, saith the LORD. putteth on his garment; and he shall go forth from thence in peace. PEACE IN JEREMIAH IS ENDED. Moreover thou shalt say unto them, Thus saith the LORD; Shall they fall, and not arise? shall he turn away, and not return? fast deceit, they refuse to return. both they should be saying and what they will say moments before destruction. family, which remain in all the places whither I have driven them, saith the LORD of hosts. he it; the pen of the scribes is in vain. LORD; and what wisdom is in them? priest every one dealeth falsely. they shall be cast down, saith the LORD. of thy trouble: for according to the number of thy cities are thy gods, O Judah. your prophets (4), like a destroying lion. shall ye have famine; but I will give you assured peace in this place. slightly helpful, no matter how popular, if it is not the right message for the time. these are not the times? of the new with judgment on all. an equivalent destruction like in Jeremiah. Prophets, and People that can be seen to be duplicated in the U.S.
saved. That is, right until the Holy Spirit is withdrawn from earth.